Samsung Flat-panel TVs with 30 channels of HD programming. Easy-access Plug-and-Play feature makes it simple to connect electronics. The La Quinta Inn & Suites Anaheim hotel is conveniently located just blocks from Disneyland Resort and the Anaheim Convention Center. At the La Quinta Inn & Suites Anaheim hotel, all we have are suites w/options! One room suites, two room suites, sofa sleepers, and/or trundle beds, there is plenty of room for the whole family. For the price of an average Anaheim hotel room, book your La Quinta Inn Anaheim hotel suite today! 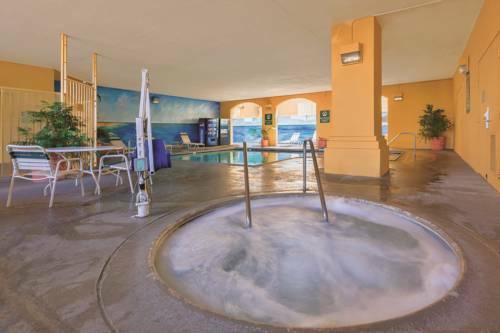 Our well-equipped Anaheim hotel offers a free Bright Side Breakfast, fitness center; year round, heated, outdoor, covered swimming pool, and whirlpool. In each suite, you'll find a microwave, refrigerator, coffee maker, hairdryer, and iron w/full size ironing board. Take advantage of the shuttle service to nearby Disneyland Resort (nominal fee for adults and children). Our La Quinta Inn & Suites Anaheim hotel is also within walking distance of the Anaheim Gardenwalk. Pets are also welcome. Please note there is a $12 per day parking fee. All reservations must be canceled 48 hours prior to arrival on the scheduled date of arrival to avoid being charged one night's room rate plus all taxes.